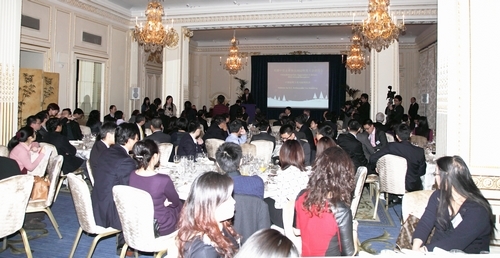 It is a true pleasure for me to attend the New Year reception of China Enterprises Association in Britain (CEAB). This event gives me an opportunity to join business leaders from both China and UK in celebration of the new year. As we see off the year 2012 the business communities of our two countries have every reason to take pride in their great achievements. Chinese statistics show that from January to November China-UK bilateral trade reached 57 billion US dollars. That was an increase of 7.1% over the same period in 2011. This was a hard won advance because during the same period China-EU trade dropped by 4.1%. During 2012, among China's major trading partners in the EU, Britain was the only one that saw growth in both exports and imports. In particular China's imports from Britain in this period increased by 17.8%. This was the largest increase among all EU members. The year 2012 was a year of exceptional records for Chinese enterprises. Their investments in Britain soared. As yet the statistics are not complete. But those available show that in 2012 Chinese companies invested more than 8 billion US dollars in the UK through joint stock or merger and acquisition. That passed China's total investments in Britain of recent years. Among the frontrunners of Chinese investors were CIC, Brightfood, Sinopech, CNOOC and Huawei. Looking forward, I have no doubt that China and the UK will make more breakthroughs in our cooperation either in capital or in projects. The sectors of cooperation will among others include infrastructure, oil and gas, offshore wind farms, food industry and information technology. · The opening of London Branch of Agricultural Bank of China. 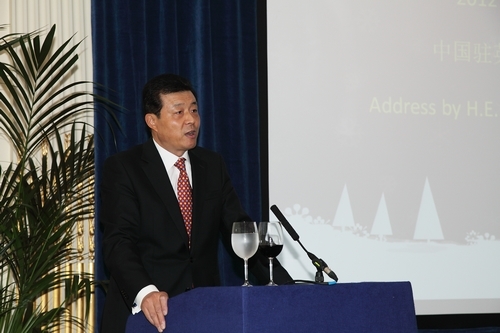 · The inaugurationof the new London office of the Industrial and Commercial Bank of China. · The introduction of CTExcelbiz of China Telecom. · And the launch of direct flights between Guangzhou and London by China Southern Airlines. I have also learned that Huawei and other Chinese companies have won big contracts in Britain. This means that they will further scale up their investments here and create more jobs. All this shows that Chinese enterprises have been growing from strength to strength in Britain. As China-UK economic cooperation deepens, the CEAB with a proud history of 11 years is also growing. Its membership has expanded to more than 120. As an alliance of Chinese enterprises in the UK, I do hope the CEAB will play a more prominent part in China-UK economic cooperation. In my view you have three main roles to play. First, the role of a model. I hope you will frequently share your experience with Chinese companies at home. Your success here will inspire more of them to make investments and develop business in Britain, explore markets in UK, Europe and beyond. Second, the role of a platform. I hope you will offer a platform not only for exchanges among Chinese enterprises, but also for closer ties with various guilds and trade associations in Britain. I encourage you to organize various events in collaboration with your British counterparts like the 48 Group Club and CBBC, London Chamber of Commerce. Fulfilling this role, you will help Chinese companies and entrepreneurs with better understanding of their UK counterparts and in turn facilitate their cooperation. Third, the role of a spokesperson. To succeed in Britain, Chinese enterprises need to create a positive image. This requires not only the efforts of each individual company, but also the presentation of CEAB as their collective spokesperson. I hope you will show the British public not only the diligence of Chinese enterprises but also their commitment to rewarding local communities and strong sense of social responsibility. At the same time I expect you to help address legitimate concerns of Chinese enterprises and protect their lawful rights and interests. · In this way CEAB and its members can seize fresh opportunities and make more targeted efforts. · CEAB and its members can creatively play a crucial role in promoting mutual benefit between our business communities. · All these ambitions and efforts will contribute to the common prosperity of our two countries. In conclusion I wish all of you good health and a happy and prosperous year of the Snake!